During the financial crisis, the Fed first lowered the federal funds rate to zero and then purchased large quantities of long-term Treasuries and mortgage-backed securities to reduce long-term yields. The Fed took both these actions to boost economic activity. The figure shows that emergency lending and these bond purchases rapidly expanded the Fed's "balance sheet" from $900 billion in 2008 to $4.5 trillion in 2014. The purchases provided a steady source of liquidity to initially distressed markets. Purchases and communications (i.e., forward guidance) signaled to financial markets that the FOMC would keep short rates low for longer than previously expected. Asset purchases removed duration risk and particular bond maturities from the market, reducing yields of related bonds. These effects are called portfolio balance and local supply effects, respectively. 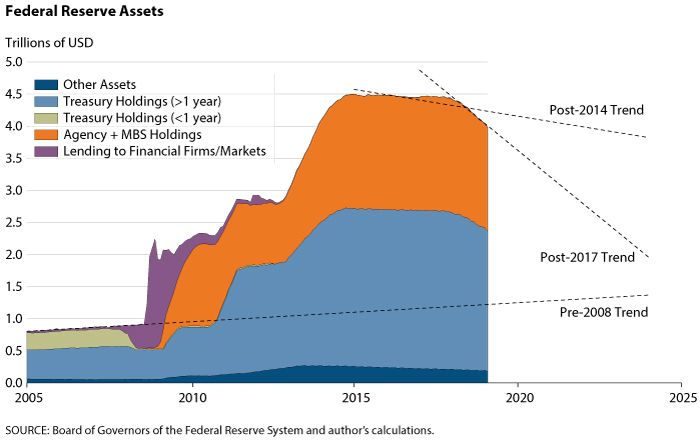 Since peaking in 2014, the Fed's asset holdings have been declining by about $130 billion per year, and this decline has accelerated since February 2018. Some analysts blame last year's bearish stock and bond markets on this post-2017 drop. They reason that if the original quantitative easing programs reduced yields and boosted the economy, then the reversal of such programs will surely do the opposite. It is true that removing unusual monetary accommodation will likely result in less real activity and lower prices than otherwise, but the ongoing shrinkage of the Fed's balance sheet was not responsible for bearish asset markets in 2018, nor is it likely to significantly retard activity going forward. There are several reasons for this view. First, beneficial liquidity effects on yields will not be reversed, as they resulted from the repair of temporarily illiquid markets. Second, much of the original benefit of unusual monetary accommodation has been gone for some time. The end of Fed bond accumulation in 2014 and the federal funds target increases that began in 2015 surely ended any remaining signaling about unusually accommodative short rates. Third, the U.S. Treasury has already partially reversed Fed long-bond purchases by extending the duration of the Treasury's offerings. In other words, while the Fed bought more long bonds to drive down yields, the Treasury issued more long bonds at those lower yields, partially reversing the Fed's efforts (Greenwood et al., 2014). Finally, the gradual reduction of portfolio balance and local supply effects will produce small and gradual yield changes of a few basis points per year for many years.3 The figure shows that rough linear approximations indicate that the pace of the recent decline in the Fed's asset holdings—if such declines continue—would take at least five years to return to the pre-crisis trend.4 Such gradual effects contrast with the large, discrete asset price changes that immediately followed the original asset purchase announcements and reflected almost the whole expected near-term change in fundamentals. In summary, most of the yield reductions from Fed unconventional policies are probably already undone; some will not be reversed (i.e., yield changes from the reintroduction of liquidity in bond markets); and the remaining effects will probably disappear gradually, over the course of many years. As a result, quantitative tightening will probably not affect the economy in any noticeable way. 1 Bullard (2019) presents a somewhat different case for small effects of the Fed's balance sheet reductions. See https://www.stlouisfed.org/on-the-economy/2019/march/bullard-when-quantitative-tightening-not-quantitative-tightening. 2 Ihrig et al. (2018), for example, estimate that, as of 2015:Q1, all Fed QE operations together had reduced the 10-year term premium by 55 to 145 basis points. That is, in the absence of these Fed policies, the U.S. Treasury term premium would have been 55 to 145 basis points higher than it actually was. 3 Bonis, Ihrig, and Wei (2017) estimate that the evolution of the Fed's asset portfolio will produce such modest and gradual effects on the 10-year term premium. 4 The FOMC has not yet announced a firm target for the long-run level of the balance sheet. Most recently, Chairman Powell has stated that "[S]omething in the ballpark of the 2019:Q4 projected values may be the new normal." The Chair has also expressed a willingness to adjust the trajectory of asset holdings to conditions. See https://www.federalreserve.gov/newsevents/speech/powell20190308a.htm. Bonis, Brian; Ihrig, Jane and Wei, Min. "Projected Evolution of the SOMA Portfolio and the 10-year Treasury Term Premium Effect." FEDS Notes, September 22, 2017. Greenwood, Robin; Hanson, Samuel G.; Rudolph, Joshua S. and Summers, Lawrence H. "Government Debt Management at the Zero Lower Bound." Hutchins Center Working Paper #5, Brookings Institution, September 30, 2014. Ihrig, Jane; Klee, Elizabeth; Li, Canlin, Wei, Min and Kachovec, Joe. "Expectations about the Federal Reserve's Balance Sheet and the Term Structure of Interest Rates." International Journal of Central Banking, March 2018, 14(2), pp. 341-91.